Property investment in Malaysia is a huge industry. With development earmarked for countless regions in the respective corridors around the country, the property development sector has been growing and this will continue to grow into the next decade or so. One of the prominent people who are highly regarded in this sector is Tan Sri Datuk Hj Mustpha Kamal bin Hj Abu Bakar. 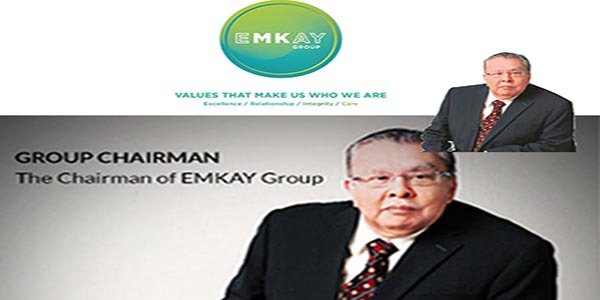 He is the founder and one of Malaysia’s leading property developer Emkay. It all started for Mustapha when the company first embarked in the development of Bandar Baru Sg Buloh in Selangor which was then the first ever ‘large-scale privatized property development scheme’ which was carried out based on the policies of the NEP (New Economic Policy) that was envisioned to improve the bumiputera livelihood. The project was a huge success as it created more homes as well as new communities among Malaysians then. Mustapha is known to be a true visionary as he would continue to grow Emkay and ventured into more property related projects that involved the likes of residential areas, corporate regions as well as resorts and such thereby creating more comfortable and modern homes for people and countless job opportunities as well. One of Mustapha’s biggest contribution into the development of the country was when Emkay was invited by the Malaysian Government to be involved in the property development of intelligent city Cyberjaya in 1997. Emkay then held a minority stake in Setia Haruman Sdn Bhd, the company responsible for this project and 10 years after Cyberjaya was built, Mustapha is the majority stakeholder and the chairman of the company. Today, the Emkay Group is well-known for building world-class homes as well as the vision and foresight of Mustapha who has been instrumental for the group’s success. The NeoDamansara in Damansara Perdana and its surroundings are among some of the most successful projects undertaken by Emkay while the company is also responsible for the Pulau Banding Development Project in Gerik, Perak, the Bangunan Mustapha Kamal and MKN Embassy TechZone projects in Cyberjaya.